Hardwoods are generally better for burning than softwoods. As a rule of thumb hardwoods are produced by slow-growing deciduous trees (those trees that lose their leaves) and therefore the logs have a greater density than the faster growing softwoods from evergreen trees. Since hardwood logs are heavier than the same sized softwood log they will provide you with much more heat output – up to 50%. 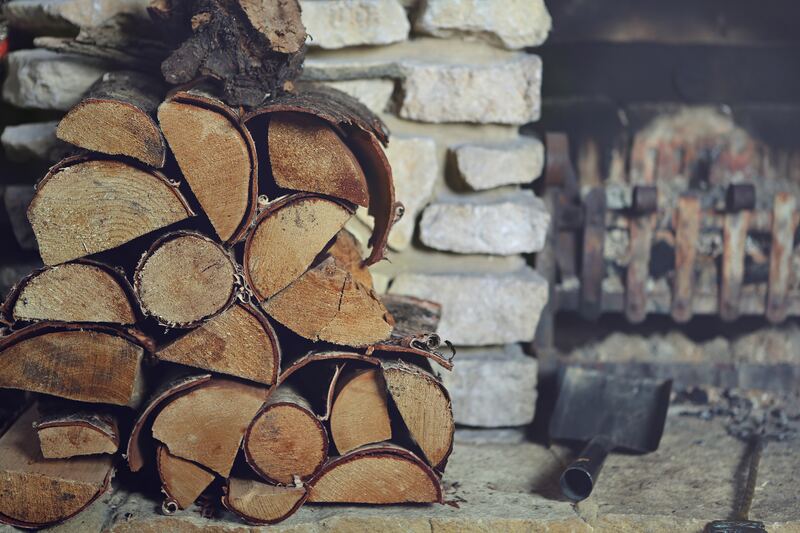 For the stove owner, using hardwood logs means having to fill the stove up less often than they would with softwood logs. Only ever use dried, fully seasoned chopped wood logs with a moisture content of less than 20%. As a rule of thumb, wood which is well seasoned makes a distinctive ‘clack’ rather than a dull ‘thud’ when knocked together. It will also feel much lighter than an unseasoned log. Other indicators of a seasoned log include the bark peeling away and cracking and splitting of the wood around the outside. Ideally wood should be seasoned outdoors for between 18 to 24 months – the harder the wood then the longer the seasoning. It should be stacked off the ground with plenty of space between the logs to allow air movement and with the top covered to keep rain and snow out. It is said that seasoned wood will give you approximately 50% more heat output than the equivalent unseasoned log so that alone makes it very worthwhile. A moisture meter specially designed for testing wood logs is highly recommended and a small investment which will pay for itself over and over again. Most types of hardwood, for instance Ash (generally regarded as the best), Birch, Beech, Oak and Elm can be used. However, avoid burning woods with a high resin content. As a rule of thumb, the heavier the wood, then the greater the heat output and the longer burn time – the time between refills. Alder produces little heat and burns quickly. Apple burns slowly and steadily with reasonable heat and a lovely smell. However it produces a disappointing flame. Ash Widely regarded as a great burning wood, with low smoke and an excellent flame pattern (even on slow-burning) which provides plenty of heat, as well as being readily available wherever you live in the UK and Ireland. You may read elsewhere on the internet that it can also be burned 'green' because, unlike most hardwoods, Ash has a relatively low moisture content – but please don't. Burning green wood is never a good idea, either for your stove and flue or for your neighbours and the environment. However, the reduced water content does mean that Ash logs will dry out just that bit quicker than most, and certainly faster than Oak and Elm. If you have to create your own log lengths then Ash is very easy to saw and split as it features fewer awkward knots than some hardwoods. Beech Makes a good log which burns well. However because of its high water content it can take much longer to season than most other log varieties. Birch These logs burn quickly but nevertheless provide good heat output, bright lively flames and a pleasing smell. Best mixed with other slower burning logs such as Elm (particularly slow burning), Ash or Oak. Cedar Produces a well burning log with long lasting heat. Cherry A lovely slow burning wood producing a good heat output as well as a lovely smell. Great at Christmas. ChestnutNot a particularly good wood fuel with reasonable a flame and heat output. Cyress Fast-growing garden tree. Difficult to handle before being cut into logs because of the density and numbers of branches. Burns very quickly so best mixed with other logs. Elm A good firewood and unfortunately because of Dutch Elm Disease it has been in plentiful supply in recent years. Burns well but slowly so it generally needs a faster burning log to help to get it going. Once established it gives out good long-lasting heat and is the ideal log to put on last thing at night because it burns so slowly. It’s very high water content means that it is not quickly seasoned. Eucalyptus A fast-growing ornamental tree which needs to be kept on top of in small gardens hence its inclusion on this list. Must be very well-seasoned but produces an obvious pleasant aromatic smell and burns reasonably well. Hawthorn If you can get hold of this already cut into logs then it makes a steady burning firewood producing a good heat output, otherwise its vicious thorns make it very unpleasant to handle no matter how careful you are. Hazel Burns quite fast but still produces a very good heat. Holly Produces little heat and is fast burning but has a bright flame. Laburnum If you chop down one of these in your garden then our advice is to take it straight to the tip. Every part of the tree is poisonous and when sawn a nasty sulphurous yellow sap oozes from the cuts. Even when seasoned it produces an inordinate amount of foul smelling smoke and will render your Airwash system obsolete. Larch A large fast-growing conifer which, unusually, loses its leaves in the Autumn. This softwood produces a reasonable heat but like Pine has the potential downside of leaving oily and sticky deposits in the flue system if not burned at a high temperature. Best mixed with other woods and not recommended for slumber or overnight burning. The discovery of the Phytophthora Ramorum disease in 2009 in the UK, which affects Larch trees and requires diseased trees to be felled, may result in a cheap plentiful supply. However, the movement of potentially infected logs may be legally restricted, so please ensure that you buy your logs or kindling, which could contain Larch, from a reputable source. Lime Not the best of hardwoods with an unimpressive flame. Oak Generally considered one of the very best wood fuel logs and therefore much sought after. However it must be seasoned for a long time – at least two years. It burns fairly slowly with nice flames and produces an excellent long lasting heat even when only the embers are left. Pear Similar to Apple wood, burns slowly and steadily to provide a reasonable heat and, again, with a pleasant smell but disappointing flame. Pine wever because of the high resin content excessive use could eventually cause problems in the flue system with oily and sticky deposits. Better to mix with other woods and do not burn slowly. Poplar Not recommended – even when very well-seasoned it burns poorly and produces an unpleasant black smoke. Rowan Produces slow well burning logs. Spruce A softwood, which weighs around a third less than an equivalent oak log so it will burn very quickly. From our own experience it produces a low heat, can be smoky and produces some sparks, so it is really only any good for starting fires and should ideally be substituted with a harder wood on the first reload or generally mixed with hardwood. It does however split relatively easily. Sycamore and other Maples Makes a good wood fuel log, burning well with a moderate heat output and good flame. Willow Even when very well-seasoned Willow produces poor slow burning fire wood with little flame. Yew Slow burning with tremendous heat. Never use wet or unseasoned (green) wood as this will cause nuisance smoke and a very disappointing fire. It could quickly result in the build up of soot and creosote which, because of the higher temperatures of stove flue gases, could easily cause a flue or chimney fire. In addition, burning wet wood creates other environmental problems, a less efficient fuel economy and can eventually quickly clog your flue system and cowl. Burning wet or unseasoned wood will also reduce the effectiveness of the stove’s Airwash system thus causing staining and blackening of the glass. How often should I have my chimney/flue system swept? Wood: quarterly when in use.